As promised I can now reveal some of the things that I made for this Xmas as gifts for friends and family. I did do a lot of knitting which I will put in a later post but also some of my favourite traditional stitching. 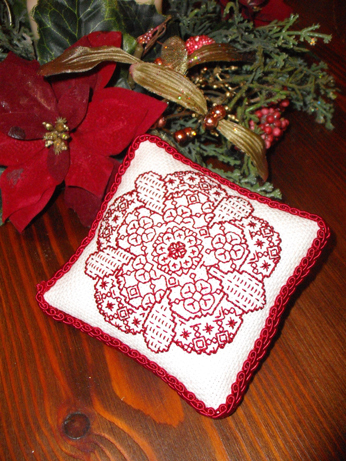 The pattern comes from Issue 165 of New Stitches magazine and is called Cherry Rose – I only stitched the flower element – the whole thing is designed to be a picture and includes stem and leaves as well. 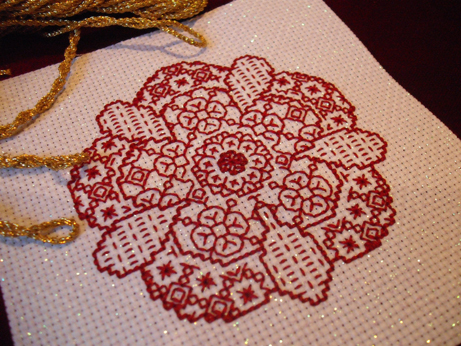 It is stitched on my favourite 28 count sparkly evenweave (it is only to be used at home not at events as blackwork (or redwork!) is not authentic for our period) with dark red Silk Mill thread. For the finish I chose to back it with some red velvet I had in my stash and to edge it with some dark red braid. I also added some of my favourite little brass charms – I love using these on sewing gifts like the scissor keeps I made last year. 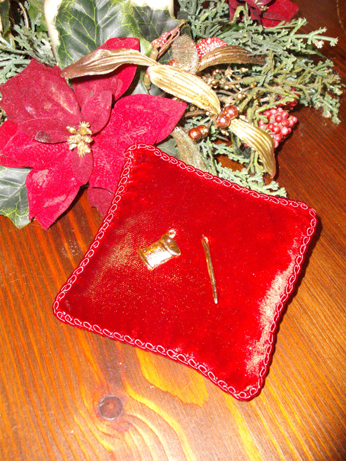 This time I chose a spool of thread charm and a needle charm – both from the charms pack I bought from Stitch Direct earlier in the year. I was pleased with the finish – it was the first time I have used velvet as a backing and it wasn’t as slippery to work with as I had feared -and Denise likes it too which is good! I realise this is the third post this week – a record for me I think. It is all to do with the snow as not much else has been going on this week. Did leave the house today for the first time since Saturday to go to Knitting Group. As well as Knit and Natter that meets weekly at the wool shop – shop info at the end of this link (Woolly Minded and Beady Eyed) I also go to a monthly one at the same shop – Yarn – which meets the second Thurs of every month 5 – 7 pm. Had a very nice evening working on my teddy bear bag project and have also bought some more Noro Silk Garden wool to make myself a beret to match the Noro scarf that I wear. I cast on for this when I came home tonight and am using a simple pattern in my favourite Moss stitch. If this freezing weather is to continue a girl needs some head protection! Some pics of sunny stuff!